This is Pickles (our two year old named her). We have had her for about a week now. 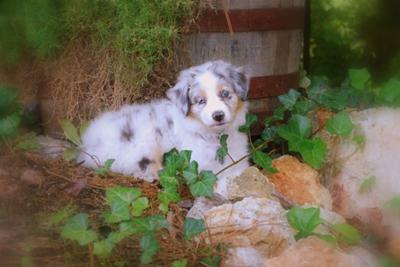 She is a beautiful, 8 week old, Aussie puppy, full of energy. She loves to chew on everything! She loves to play outside and chase balls,squeaky toys and our two year old. But at night she just loves to snuggle up in the bed with us right on the pillow. So far, so good with the the house training but we really have to be on top of it. We have to make her go out in the heat of the day. Not too happy about the hot days! She seems to be a very smart puppy.